Antari X-515 Fog Machine DJParts - All Variety of Parts that DJ Needs. 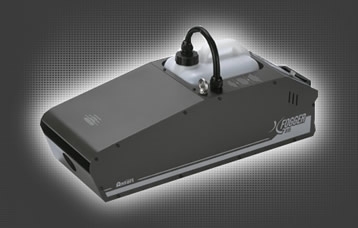 The X-515 fogger, the main force of X Series and is the most advanced fogger in the professional performance market. Under its streamline contoured body lays a 100% pure aluminum cast heater, heavy-duty and silent running pump, and Antari’s proprietary circuit design. The highly efficient but powerful heater produces a clean and dry fog at an unparalleled level for a machine in this class. The customized rubber pump mounting helps the already quiet pump to achieve virtual silence. The unique designed circuitry is 100% resistant to external power interference and so guarantees complete stability in thermal control. This combination of great features and advanced design make the Antari X-515 an obvious choice for the professional rental company and their client base of Theatres, TV Studios and major staged events. • Output: 20,000 Cu.Ft / Min. • Heat up Time: 11 Min.